Do these have to be stored away in the winter? I've heard the material goes brittle when temperatures drop below 0 degrees. Check with your supplier, my rate with Bulb is 13.2p kWh. This has been asked time and time again but from what I've seen, surely this bumps up your electricity bills quite a lot? Picking mine up tomorrow, got to drive blooming 60 miles to nearest one with stock. Just let the rain fill it up. And thats why they are a bargain! Pro tip If you're going to give someone a clapback, make it one that makes some form of sense at the very least. Priced at £200 but further £10 with voucher in magazine available at entrance of store. Pretty sure only available in store. They were wheeling more out as I left. I waited the full duration. Didn't get a delivery so my bank sorted the refund out. Have they taken payment from you? I've emailed them several times asking for a refund on the extra payment they took, but have had no reply's as yet. I'm concerned we will never see the item ordered, has any body taken delivery yet or even got a delivery date? ordered the day this offer came came . got email from this french company saying it would take 3-4 weeks. Ordered and had an email on Friday 5th stating there is a delay of 20-25 days, do i want to wait? Replied telling them I am happy to wait. Checked credit card on 6th and they have taken 2 x £198 !? (shock) No further emails from them. Think I am going to be contact my bank on Monday. folk on here dont like hot tubs. They think they're for the common people . why cold? i thought this was a good deal ? Saw this and had to post as it’s £50 off the usual price. Reduced to £250 in store at B&m and they have lots in stock. Gutted bro you should claim under your insurance for accidental damage it’s worth a try! Not happy........summer is over! Evicted them, should've taken a damage deposit! You kept the bloody thing working all winter???? Were you going for a dip daily or once a week? So can these be left out all year? I’ve seen some reports saying not for outdoor use in winter. It was mostly for her 8) It's Welsh gold, since she's Welsh. They do the rings etc for royal weddings. You said: "I gave my wife one for Christmas" It was wasted on you, wasn't it? (y) Clogau jewellery? Is that like posh Pandora? She also got (another) Coach handbag and some Clogau jewellery so she did just fine. I gave my wife one for Christmas and I think it's fantastic. We've been in every evening since and thankfully no looky-loos overlooking us. But yes, no chavs in my village. Is this one of them echo dots people talk about? Ready to buy but need 5 supermodels to come with it. Ever seen those articles of birthday parties and no-one comes? Then gets flooded with cards and presents from the entries country. Will that tactic work here? Just me and the spa? Only females of certain measurements will be accepted! Viva la Benny Hill! Never miss a 'Lay-Z-Spa' deal again! Takes about 2-3 hours to fill depending on your house and tap. Not ideal time to set these up as if it's below 3 degrees and it turns off, if it freezes out and damages the tub, the warranty won't cover it. Making extra sure mine isn't turning off as the temps are dropping. How quick to inflate these? I dont know about you, but nothing makes me relax more than sitting in a dingy that's glowing neon green! 12 filters (6 twin-packs) at a great price of less than £1 each. 30 degree wash. You can wrap them if you like. Personally I don't worry about that. Do you put them in an ordinary wash, what temp? Do you put them in a pillowcase or anything? Great lazy spa and price. I've got one. I had this on My amazon list for a while and noticed a material drop. camelCamelCamel also suggests this is one of the lower priced offerings for some time. Not a bad price for the 6 person. I think people are confusing it with the 4 person. Isn't this what Studio usually offer for around £369? Lay-Z-Spa Vegas reduced to £309 at Tesco Bury. There were 2 left. Happy hunting! They have riviera lay-z-spa in my local store, Abingdon for £300 reduced to clear from £400. Got 5 in stock. It is £300 in Tesco a Formby.At least 10 left earlier today. On sale in tesco Braintree. May be in other stored as well. If you have family/friends discount £280. They had one at the same price in Bicester too. Great price for this and cheapest in stock around I believe. Not many so be quick! 599.99 at the moment, expensive one that is! Yep sold out as the price you’re seeing is a different seller. When I click the "Get Deal" link, Amazon shows a price of £574.99. I thought Prime Day lasted until tonight/tomorrow? Maybe just sold out? We’ve got dogs and so far no interest apart from one whodetermined to want to sit on the cover thinking it was solid.......once he found out he wasn’t he hasn’t bothered. We have Shih Tzu’s though lol JRTs might be more determined. In the past decade, Lay-Z Spa have become the UK's most popular supplier of garden hot-tubs, offering affordable, reliable luxury products for ordinary homes. If you feel like adding a spa hot-tub to your outdoor space, there's no better place to look. However, the Lazy-Spa range has expanded to include plenty of options, so making the right choice isn't as straight-forward as you might think. 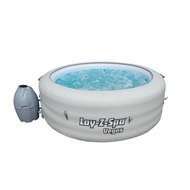 This buyer's guide will lay out the Lay-Z Spa options, from the smallest tubs to the plushest, most spacious premium 7 person models. We'll have a look at how to pick the right spa for you, as well as some suggestions for accessories to stock up on, and how to keep your Lazy-Spa tub in peak condition. The Lay-Z Spa story begins in 1994 with the foundation of Bestway Inflatables & Material Corp in the USA. Bestway grew throughout the 1990s, becoming one of the leading manufacturers and suppliers of outdoor leisure products. So it wasn't surprising when it also became a world leader in home spa installations as well. Lay-Z Spa emerged as one of a Bestway's most successful brands, finding happy customers in Australia, continental Europe, Latin America, Asia and the United Kingdom. These days, their products are a fixture in catalogues of merchants like Argos, and Lay-Z Spa pools, with Wilton Bradley holding the contract to supply Bestway's creations to UK consumers. Today, the company has become well and truly embedded in the UK market, having sold over 200,000 tubs across the country. There's a good chance that one of your neighbours will have one installed, while plenty of people will have encountered them at hotels or spa facilities as well. How Do Lay-Z Spa Products Work? Why have Lay-Z Spa products caught on worldwide? Well, aside from increased demand from affluent home owners wanting a way to relax in relatively confined outdoor spaces, the secret lies in the way their spas are built and operate. All Lay-Z Spa products are inflatable, relying on compressed air to create a soft, watertight container which can be filled with air and manipulated regarding temperature, bubbles, air jets and other techniques. While they are inflatable devices, Lay-Z spa tubs aren't just slightly more sophisticated paddling pools. They have been designed to offer comfort and relaxation, via cushioned floors, while many models also come with seats built into the interior. Some can also be customised to suit people with arthritis or other ailments, and Lay-Z spas are regularly recommended by hydrotherapy professionals for those reasons. Unlike purely inflatable pools, they also come with solid frames to ensure that the inflated elements take the right shape. These can be either I-Beam or Circular in format (we'll look at the merits of both in a moment). In both cases, the tubs are intended to last for years without support frames sustaining any damage. Running the air or hydrojets on a spa, and ensuring proper water circulation requires the use of electric motors. However, these motors have been designed to minimise noise levels – which was once a major problem with home hot tubs. These days, you can expect to operate a Lay-Z spa at sound levels which won't disrupt sunbathers next door or ruin your newspaper reading. Are Lazy Spa Tubs Easy to Set Up and Operate? One of the key selling points of Lay-Z Spa products is ease of use. Previously, home hot tubs required professional installation and regular maintenance to ensure that they were safe to use and undamaged. That's not really the case with most Lazy-Spa tubs, which are designed to be installed by the owners themselves. Each tub comes with its own pumping system and an easy to follow instruction manual. When the pump has been plugged in and engaged in the proper location, the tub inflates from a flat state to its final form in just 2 minutes. After that, the manufacturers recommend using a dose of chlorine to ensure that the tub is as clean as possible, before emptying the initial fill, then adding water via the Lay-Z pumping mechanism. This almost certainly won't be at the perfect temperature straight away, as the tub needs to apply heat until the right temperature is achieved. Most heat water at around 1.5 degrees centigrade per hour when tubs are fully filled, so some slight waiting times are normal. Filling also takes an hour or so from engaging the pumping mechanism to settling down for a relaxing soak (depending on how large your tub is). So part of using a Lay-Z tub is knowing how to schedule the set up, achieving the right temperature at the perfect time for your hydro-massage. Again, it's worth reiterating that this procedure is very simple compared with hot tubs of the past, and the inflatable nature of Lay-Z spas ensures they they are easy to transport and fold away when not in use. Before we list Lay-Z Spa models, it helps to get to grips with a few technical terms used in their product descriptions. Firstly, you'll come across hydrojets and airjets. Both of these systems provide the massaging component of Lay-Z Spa products, but there are some important differences between them. Airjets are cheaper than hydrojets, and deliver a stream of air via a massage seam which encircles the bottom of each tub. Hydrojets are different, delivering jets of pressurised water from nozzles in the tub's casing. The intensity of both airjets and hydrojets can be calibrated – often via digital pads and remote controls, allowing inflatable hot tub owners to find the perfect way to relax. Secondly, you'll probably come across I-Beam and Circular hot tubs in the Lay-Z Spa range. There isn't much difference between how these models perform in practice. Instead the differences are structural. In I-Beam versions, the frames are welded using vertical struts, while Circular models use horizontal welding. There is one crucial difference though, which makes I-Beam models slightly more expensive. Because of the way they are welded, I-Beam models can be inflated and collapsed without the need for a separate cover. Instead, they use a technology known as Tri-Tech to create an all-in-one structure which also delivers enhanced durability. 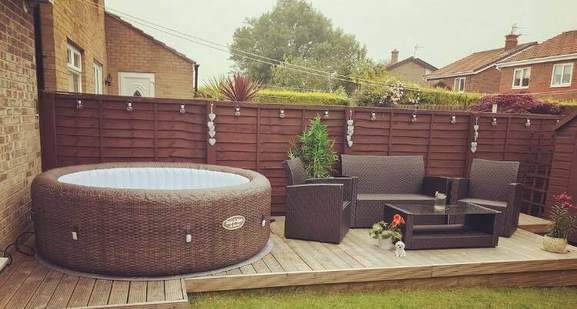 That's worth knowing about if you intend to spend hundreds of pounds on a garden Jacuzzi. Lay-Z Spa Miami Series – Located towards the lower end of the Lay-Z Spa price spectrum, the Miami series is designed to seat 2-4 people in comfort, so they are pretty spacious. 81 air jets provide a continuous low-level massage, while the internal thermostat heats water to 40 degrees centigrade. Most importantly, Miami tubs are highly portable, with a collapsible I-Beam construction, so you can fit them easily into confined outdoor spaces. Lay-Z Spa Paris Series – Another airjet collection, the Paris series is slightly more expensive than the Miami range. The main difference here is size, with Paris tubs capable of seating 4-6 occupants. This time there are 87 airjets to massage weary limbs, along with a snazzy 7 colour LED array which makes Paris tubs a great idea for evening relaxation and all-night parties. Maldives Hydrojet Tubs – The even larger Maldives range seats 5-7 people and comes with an internal bench, making them more suitable for people with limited mobility and for younger users (as long as they are over the minimum recommended age of 8 years old). They have enhanced massaging capacity as well, thanks to 8 hydrojets and 140 airjets, while a digital pad makes it easy to control the pumping settings even while enjoying the tub. Lay-Z Spa Vegas Tubs – These popular circular 4-6 seaters epitomise the luxurious spirit of Las Vegas. Affordable, portable and quick to set up, they are similar to the Miami series, with 40 degree water temperatures and an energy saving timer which limits power consumption when the tub isn't being used. The major difference is the use of a Circular construction, not the I-Beams used in Miami tubs. Lay-Z Spa Monaco Tubs – A high-end airjet series, the Monaco range seats a massive 6-8 people and are among Lay-Z Spa's largest offerings. With 86 airjets, they provide plenty of relaxation (but not as much as smaller hydrojet models), while the rigid walls are stronger than inflatable models like the Vegas or Miami while still being easy to dismantle when not in use. Lay-Z Spa Palms Springs Tubs – Another range inspired by the sunshine of the American West, the Palm Springs series seats 4-6 people and comes with an impressive 120 airjet array, providing one of the most comprehensive massaging experiences in the entire Lay-Z Spa collection. Hawaii Airjet Tubs – Similar to the Maldives range described above, Hawaii tubs seat 4-6 people but come with powerful hydrojet massaging systems. At the same time, they also feature attractive premium leather exteriors, and a sturdy I-Beam construction. Premium Series – Launched in 2012, the Premium range pioneered affordable, high-quality leather coated tubs, offering total control via LCD pads, efficient heaters, zip-up covers, incredibly easy set-up instructions, and space for 4 people. They aren't actually at the “premium” end of the company's range these days, but remain an affordable, luxurious option. All of these models come with extras in the box, including the instruction manual and at least one chemical starter kit. These are absolutely essential when setting up a Lay-Z Spa, and include a variety of water purification tablets and filters for use with specific Lay-Z Spa models. When buying on HotUKDeals, it's definitely worth checking which kits come with different deals, as you can save a lot of money on future filter purchases by choosing the right bundle. When buying a Lazy-Spa whirlpool, it's always useful to run through the whole range before making a selection, and there are several things to bear in mind when you do. Strength – Not all Lazy-Spas have the same durability. For instance, only Palm Springs Airjet, Hawaii Airjet, Siena Airjet, Palm Springs Hydrojet and Hawaii Hydrojet Pro tubs come with Tri-Tech materials as part of their construction. Non Tri-Tech models vary as well. For example, some have leather exteriors (such as the Paris Airjet), while others come with a rigid drop stitch construction (such as the Monaco Airjet). Cheaper models are coated in rayon, and offer a lower level of protection – but all are covered by extended warranties. Size – A good rule of thumb is to think about how many people will be using your tub on a regular basis, then add a space or two. Invariably, people use their tubs for parties and socialising when larger groups need to be accommodated. Sizes vary from 2 (the Siena) to as many as 8 (the St Moritz), so buy accordingly. Space can sometimes be a constraint though. All Lazy-Spa product descriptions feature their maximum dimensions, so make sure your chosen model will fit in the space at your disposal. There's nothing worse than finding it won't fit. Comfort and seating – Relatively few models in the Lazy-Spa range come with internal seats. In fact, you'll only find detachable seats on the Maldives collection. However, all feature comfortable floors, and additional floor protectors can be purchased to make them even more user-friendly. But if you need extra support, a Maldives tub is the way to go. Weight – If you're planning to place your spa tub on decking or any other raised surface, weight could be an issue. Again, Lazy-Spa tubs vary, from the 696kg Miami (when fully filled) to the massive 1,973kg Monaco tub, which could pose problems for some surfaces. The same applies if you intend to set up your tub indoors. When using Lazy Spas upstairs, it's best to go for lighter options. Do Lay-Z Spa Products Have any Health Benefits or Risks? Yes, and it's worth knowing about the risks and benefits before buying. For instance, while they are generally totally safe to use, Lazy Spas use mains electricity to heat and water, so you need to follow their safety instructions carefully, including installing RCD protection if you haven't already done so. The manufacturers also recommend that younger children avoid inflatable hot tubs for safety reasons. All Lazy Spas are graded as safe for those aged 8 and over, but below that age, they may not be safe to use. Cleaning chemicals are also essential to ensure that you can use your Lazy Spa safely, without the risk of infection. But these chemicals themselves can be hazardous if used incorrectly. All models come with detailed instructions about using chemical kits, so again – follow them to the letter to avoid any accidents. However, there are also some proven health benefits associated with using tubs. For instance, the NHS now commonly uses “hydrotherapy” to treat conditions like arthritis or bursitis, while the relaxing effect of using a tub can help ease high blood pressure and generally relieve stress. There are also encouraging signs that tubs can help with Type 2 diabetes and even insomnia – so it's worth investigating what they can do for you. Do Lay-Z Spa Hot Tubs Require a Lot of Maintenance? Not really. As we've mentioned before, all tubs need to be kept clean using chemical kits or other accessories such as pH testers. Chlorine is generally used as a disinfectant, while algaecides are also essential to prevent the growth of algae. This might sound like a hassle, but thanks to accessories like Lay-Z Spa's chemical floaters, it isn't really. When you are busy doing something else, you can just leave the tub running with the floater in place and it will purify the water and prevent bacteria or algae build-ups. Aside from that, owners also need to inspect and replace their filters on a regular basis to ensure that the water they use is as pure as can be. And the water itself needs to be changed around once a month, even if the recommended maintenance schedule is followed. The XL Entertainment Set – Featuring pillows, drinks holders and an LED night light, this set is indispensable for people who want to relax in their tub with cocktails and a few tunes on summer evenings, and is compatible with all models. Speakers – You can even turn the tub itself into an entertainment centre with water resistant speakers which clip straight onto the casing of the tub. Speakers come with Bluetooth 4.0 and the ability to work with all major smartphones, so you can use them to chat (or even do business) while the hydrojets are engaged. Detachable Canopies – Sometimes, though we hate to admit it, rain can be a factor when using hot tubs. However, with a detachable canopy, you can quickly erect a shield against sudden downpours and remain snug and comfortable in your tub. Floor Protectors – These handy pads are designed to be placed underneath Lay-Z Spa tubs, forming a layer of insulation between the tub's floor and the ground below. This doesn't just make the tub more comfortable, but also helps to make water heating more efficient, reducing the running costs of your tub. 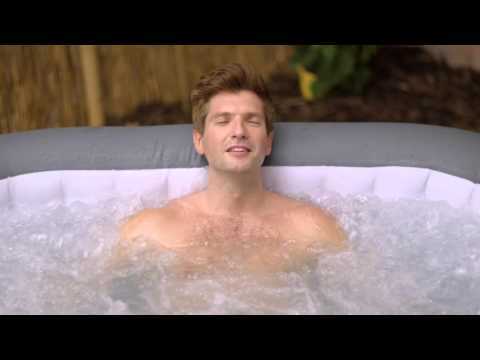 By now, you probably can't wait to get hold of a blow up hot tub from the Lay-Z Spa range. But hold on a second. These outdoor leisure devices aren't cheap – even at the lower end of the price scale, so finding the right price is absolutely essential. When you've worked out which tub you need and any accessories that are required, the first thing to do is to check the Lay-Z Spa HotUKDeals listings. You'll most likely find all of the company's tubs listed, along with bundles of chemical kits and accessories which undercut listed prices by a significant margin. Our listings gather discounts from across the UK's retail sector, and you'll find deals from merchants as diverse as Argos, The Range, B&M, Bunnings and Amazon. These retailers often use hot tub deals as a chance to promote wider sales periods, and dramatic reductions are commonplace. Shopping at the right time of year can also save plenty of money. With hot tubs, summer is generally not the time to buy. Instead, try autumn and winter, when retailers try to offload last-year's stock. Black Friday in November is a great time to hunt for bargains, and home Jacuzzis make great seasonal gifts. Relax in style in the comfort of your own garden with a selection from the Lay-Z Spa product range. 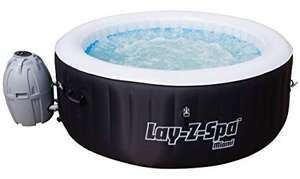 Lay-Z Spa make all kinds of tubs, with different sizes, prices and functions, so choose one which meets your need and buy it for a rock bottom price at the HotUKDeals Lay-Z Spa listings.